Even though its storylines are a bit disconnected from each other, “Kappa Spirit” is an ideal episode of Charmed in how it layers in just enough deeper context and emotional storytelling underneath the more straightforward plot patterns. Yes, it’s a Monster Of The Week episode featuring a vengeful ghost, but “Kappa Spirit” also works in some larger world building, especially when it comes to Macy’s past, and real, human conflict. That said, the episode indeed is all over the place. The jump back to the 80s feels like a tease, a premise that could have easily been the entire episode. But instead of a fun flashback episode, we get a too-short scene that drops some big foreshadowing about Macy and then just goes away. Maggie and Mel jump through a lot of hoops just to find out what kind of ghost Brenda is, and it feels tedious at times, especially when it comes to the scene where they meet with the former president of the sorority. I’m much more invested in some of the sister dynamics that play out here between Maggie and Mel, who doesn’t really understand why her youngest sister wants so desperately to be a part of the Greek system. She doesn’t come fully around on the idea, but she at least sees that it means something real to Maggie, leading to the eventual very cute Vaughn sisters initiation ceremony. The final altercation between Maggie and Lucy works, too. Ultimately, it doesn’t really matter what kind of ghost Brenda is. She isn’t the real problem; the existing tension between Maggie and Lucy is. Lucy makes her real feelings known, telling Maggie that she feels betrayed and can’t heal when she’s always around. It all feels grounded and real—almost to the point where the terrible green screen work in the roof scene is easier to ignore. And Charmed acknowledges that this isn’t a problem that can be fixed overnight. Maggie finally gives a real apology, taking ownership and assuring Lucy that she’ll step aside until Lucy decides to let her back into her life on her own terms. Despite all the supernatural camp, Charmed becomes very real in the moments that matter. Even though it isn’t an explicit focus of the episode, “Kappa Spirit” also convincingly works in some of the emotional ripple effects of Mel’s huge decision last week. The episode starts with her in bed, depressed but insisting to her sisters that she’s okay. 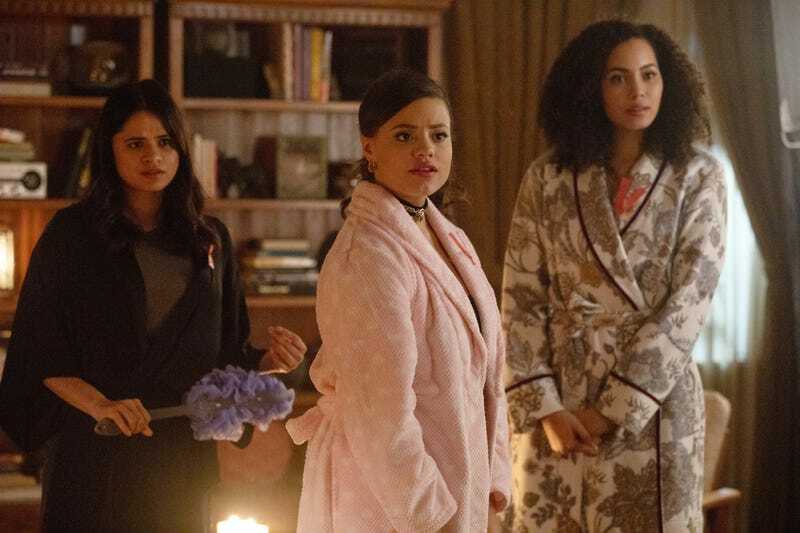 It’s easy to see that she is not okay, Melonie Diaz actually bringing a subtle but perceptible weight to her performance this week: Mel literally looks slumped through most of the episode and isn’t as fiery as usual. She’s carrying the weight of this loss, and no magical quest can fully distract her. She’s going through the motions of her life but not really living it, unable to move forward. Niko and Mel provided the romantic backbone of the series, and the absence of the relationship is fully felt. While Mel and Maggie are on ghost patrol, Macy continues to investigate the mark on Galvin, which would maybe have more stakes to it if Galvin had more of a personality. Their dynamic has been all over the place, which is maybe part of the point, but it also makes it harder to really latch onto anything. When it turns out Harry can’t see the mark, Macy learns from a psychic that it has something to do with her, a protective mark intended to keep magic away from Galvin. Things take a bigger turn when the psychic implies that there’s a darkness within Macy. 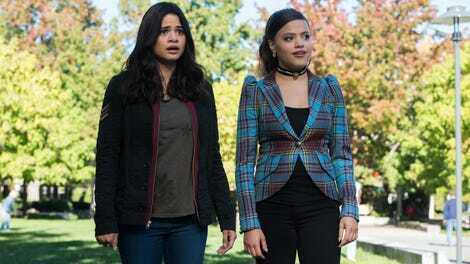 Coupled with the flashback in which their mother reveals that she’s worried that something might be wrong with her baby (which would have been Macy based on the timeline), Macy’s arc is just getting started. We don’t have a lot of answers yet, but the suspense builds well in this episode, even if the Galvin of it all isn’t all that convincing at the moment. I know The CW just had another 80s episode thanks to Riverdale, but I still feel like an opportunity was missed here. Charmed could stand to play around a bit more with its structure, even if it’s in a gimmicky way. “That ‘70s Episode” is a classic installment of the original series. Harry’s relationship with the sisters really is so sweet. Maggie complaining about all the spells being in Latin is great.